What is Sheplers' 10% Lowest Guarantee? 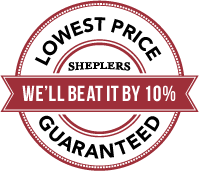 If you find a current lower price on an identical, in-stock item from another retailer, we will not only match the price, we'll beat it by 10%, GUARANTEED! Call our Toll Free Number (1-888-835-4004) to place your order. Advise the representative that you found the item available at a competitor for a lower price, and direct them to the competitor's page that shows that price. The Sheplers customer service representative will verify the lower competitor price. Factory "Second", "Blemished" or "Used" items. "Clearance", "Going out of Business", "Liquidation Sales", "Limited Quantity Sales" or similar instances priced below standard dealer cost. Any Auctions, affiliate coupons, "first time customer" promotional offers, paid or unpaid membership clubs, unauthorized dealers, private individuals, or stores not located in the United States. Items for sale Thanksgiving day through the Monday after Thanksgiving.